Large comfortable holiday home with plenty of space. An ideal home for 2 families or extended family with a range of sleeping options. Locked garage great for your skis, boards and bikes, or one car. Off-street parking for several cars and boats at rear. This place has space to really relax. Two sleeping areas - main area upstairs with four bedrooms and the loft, which is an internal access bedroom / rumpus room with its own entertainment. Great for school kids and teens. Put the little kids or oldies to bed while big kids stay up late. Two new full sized modern bathrooms, both with showers, one with separate bath. Enjoy activity or relaxation. Beach chairs for the Lake, outdoor games, one older bike + helmets suitable for lakeside path or biking to town, trail maps for hikes, 2 kids scooters, and a 2-3 person canoe + life jackets for use only on the lake. Three council parks - two right next door, one with toddlers play area. A fantastic all-ages kids playground in third park accessed across the road. Extras to suit a family group of 10: two DVD players, Freeview TV in main lounge, good Wifi, Wii console and games, rumpus/entertainment area in loft bedroom, board games, DVD library, books, a few toys, outdoor games, extra stools, second outdoor table and benches. Fully equipped large kitchen for self catering for 10 and a few guests. Second fridge/freezer in garage if required. Full laundry. Small children: cot (for hire), highchair (for hire), garden fully fenced. Fantastic ski pad: Lovely warm house - relax by the fire or flick on the gas heater; read a novel or grab a movie from our DVD library. 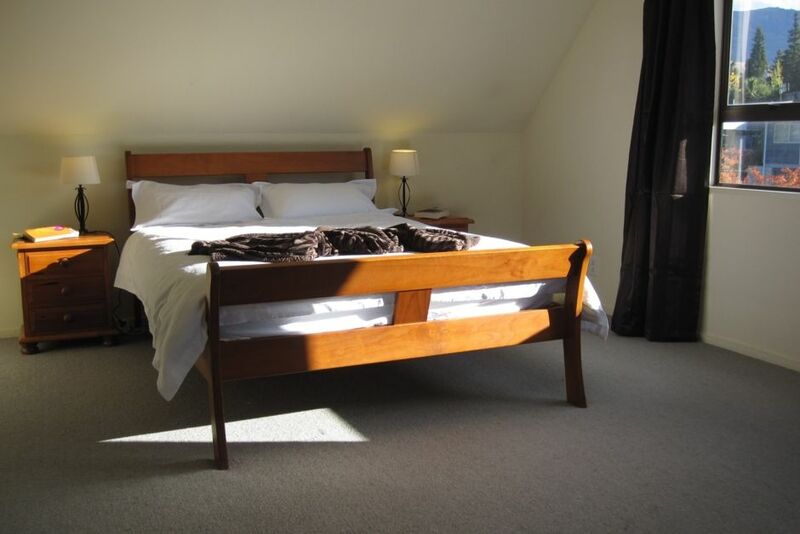 All bedrooms heated, electric blankets, winter duvets and rugs for all beds. You won't be cold in this house. Summer relaxation: Long shady veranda, private screened BBQ area with plenty of outdoor seating and well established fully fenced garden - great for summer relaxation and BBQ after a day at the lake. Other seasons nightly fee INCLUDES cleaning fee for stays of 7 nights or more. Cot andamp; highchair - bookable for small fee. We are a family of five who love spending time skiing, hiking, biking and lake swimming in this very special part of the New Zealand especially skiing our local mountains and exploring the lakes and National Parks (photo: kids exploring at the Matukituki valley in Mt Aspiring NP). Relax family holiday house is a super relaxed, spacious place to be on holiday. It has space for all the bikes, all the ski gear and even room for a second family or the extended family. Its close enough to town and lake to leave the cars at home. Town is an easy walk for dinner, a late breakfast or to the fantastic local movie theaters. The lakeside paths, mountain bike tracks and Mt Iron are all close by for an easy lakeside cycling day, a mountain biking blowout or a run/walk with a view. Spacious house with five bedrooms and no cramped bunk rooms (no bunks beds at all). Our leafy, fully fenced, and well established garden with relaxing outdoor spaces - we even have hammocks and deck chairs. Our hot hot wood burner make winter nights cozy and relaxing. Indoor dining table seats 8 adults + has four stools for extra people/children. Outdoor table - beside dining area seats 16 people. Double sit upon plastic Ocean River Kayak with paddles and assorted life jackets. Lovely warm and clean home in a quiet location. Plenty of room for our group of 8 with the kids having their own quarters. Only thing preventing 5 stars was no view of the lake but this is reflected in the price. Thanks so much and we will definitely be back! Warm, comfortable house with tonnes of room for our two families of 4. Kids loved the loft area and all the games books and dvds for after a big day in the mountain. Lovely fire, lots of heating throughout and great water pressure. Kitchen had everything we needed to cook for 8. Loved our stay here. Awesome house with everything and more you would need! Awesome house with everything and more you would need! Warm and heaps of space for our 2 families! We will be back! very freindly owners, very flexible. very freindly owners, very flexible. house was very clean and comfortable, enough room for 6 adults and kids and still enough privacy! great area, only 20min walk/5min drive to the lake/town. fully fenced, perfect with kids. kitchen well equipped.